A series of twenty one chalcone derivatives having indole moiety were synthesized and were evaluated against four human cancer cell lines. Indolyl chalcones 1a, 1b, 1d, 1f-1j, 2c, 2e, 2i showed good anticancer activity. Chalcones 1b and 1d were the most active and selective anticancer agents with IC50 values <1μg/ml and 1.51μg/ml, against WRL-68 cell line, respectively. 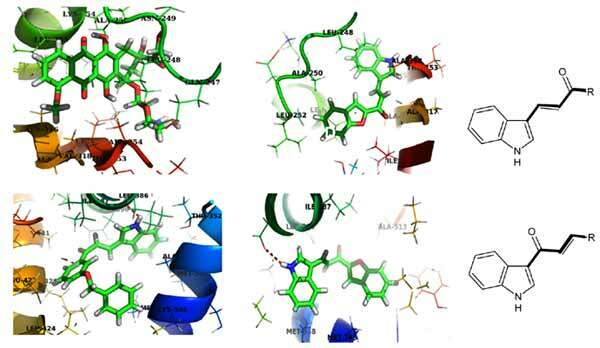 Molecular mechanism was explored through in silico docking & ADMET studies. 1, 3-Diaryl-2-propen-1-ones, Anticancer agents, Indolyl chalcones. Medicinal Chemistry Division, CSIR-Central Institute of Medicinal and Aromatic Plants, Lucknow- 226015, India.